Just before printing, Ecofont unnoticeably converts all letters and characters in your document into an ink-saving equivalent of those letters and characters. This looks exactly the same as the font you use on your screen, but with significantly less pixels actually printed. Independent tests from Buyerslab demonstrate savings up to 50% in toner ink with Ecofont compared to normal printing. 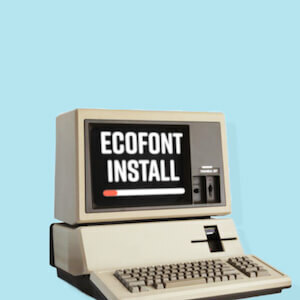 You can install Ecofont in just a few mouse clicks. It operates like any other standard printer driver and works independently from other software. Ecofont is compatible with any Windows system and application. You can use it with any printer you’d like. Our software is installed on your system and acts as a printer driver. No change in hardware or software is required. It’s as easy as that! Our subscription fees are based on potential savings. If you purchase black ink cartridges three times per year, the cost will run between €60 and €100 a year depending on brand and size. We charge a limited annual fee for the use of our software to save on printing cost for as long as you continue to print. Enterprise customers with high printing volumes have access to discount pricing levels. Easy earnings, good cause! How does Ecofont save ink? Just before printing, Ecofont unnoticeably converts all letters and characters in your document into an ink-saving equivalent of those letters and characters. This looks exactly the same as the font you use on your screen, but with significantly less pixels actually printed. These so called ‘holes’ are hardly recognised by the human brain, and therefore the quality of the print is still exactly the way you were used to. Which fonts are supported by Ecofont? Ecofont currently supports the most commonly used fonts such as Arial, Calibri, Tahoma, Times New Roman and Verdana. Future updates will include additional fonts. Can I use Ecofont with any operating system and program? Ecofont operates like any other standard printer driver and works independently from other software. Ecofont is compatible with any Windows system and application. No maintenance is required. Do I need a special printer to use Ecofont? No, you can continue using your own printing solutions. Our software is installed on your system and acts as a printer driver. No change in hardware or software is required. How much ink do I save with Ecofont? Independent tests from Buyerslab demonstrate a 46,5% saving in toner ink with Ecofont compared to normal printing. Which languages are supported by Ecofont? The Ecofont Virtual Printer software is currently available in English, German, Dutch, French, Spanish, Portuguese and Turkish.